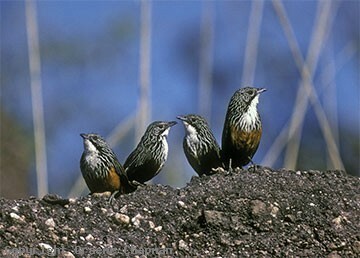 White-throated Grasswrens occur only in largely inaccessible, rugged sandstone country in western Arnhem Land, see map (516205). 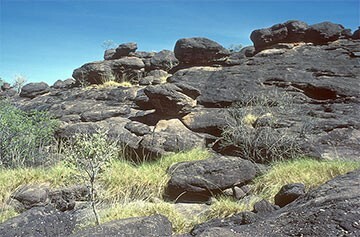 The great Arnhem Land escarpment is a major feature of Kakadu National Park and that is where most people go to see this species, in particular to Gunlom, a popular camping spot on the South Alligator River. There, a steep climb up the escarpment alongside Waterfall Creek leads to an area (516206) where grasswrens used to be be seen regularly but in recent years, more frequent burning of the spinifex has resulted in less than ideal habitat and fewer sightings. However, back across the South Alligator River in the vicinity of Plum Tree Creek where these pictures were taken, there is more easily accessible country where a darker conglomerate provides suitable habitat (516204). This type of country occurs on the western side of the river for quite a distance upstream and I have seen grasswrens up there across from the old El Sharana mine site (516208). 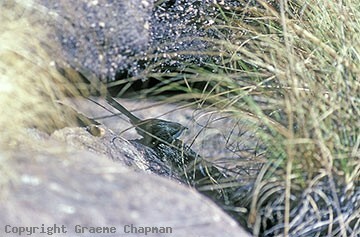 White-throated Grasswrens are now one of the least frequently seen of all grasswrens, mainly because of the inaccessible nature of their habitat. Not only are the rocky escarpments steep and dangerous, in most parts of Kakadu National Park, it is illegal to go wandering around away from designated roads and tracks. 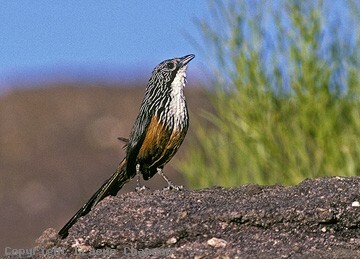 516201 ... White-throated Grasswren, male. 516202 ... A family group of four. 516203 ... Hiding from Brown Falcon overhead. 516204 ... Habitat on west side of S. Alligator River near Plum Tree Creek (Gunlom area).